Have plans for a new room addition? Are you contemplating acting as your own general contractor and doing a lot of the work yourself, or do you plan on hiring a room addition contractor. If you plan on doing the latter, make sure to choose your room addition contractor wisely. Hiring the wrong home remodeling contractor could cost you big. The horror stories about hiring bad contractors are endless. Talk to nearly any homeowner and they have a story to tell you about a bad home remodeling contractor experience.The stories vary from massive cost overruns, long schedule delays, and contractor theft on the jobsite. So before hiring the first room addition contractor you talk with make sure to do your homework on them first. Check their references. Check with your states Better Business Bureau. Check with your state to confirm their contractor license is up to date and that there are no legal actions against them. And finally, check to make sure their insurance liability coverage is current. All these checks are essential to mitigate the risk of another room addition project gone afoul. In addition to all of the background checks make sure when hiring a room addition contractor that they exhibit the professional experience and skills necessary for building your room addition. Moreover, look to hire a room addition contractor who has experience with the particular room addition you are planning. For example, if you plan on building a sunroom addition, make sure the room addition contractor has specific experience in building sunrooms. More specifically, he or she should be able show you a portfolio of pictures and testimonials of past sunroom additions that he or she has built. Also carefully evaluate a room addition contractor’s work ethic and practices. 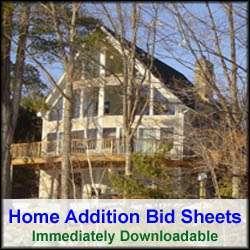 You can often glimpse a clue of these attributes in how responsive they are to your phone calls and how detailed they are with their room addition bid proposal. The more detailed their bid proposal is, the more likely they know what they’re doing. Also, the more upfront questions they ask you about your project such as your budget constraints, timing requirements, and specific features and materials you desire in the room addition, the more likely you’ll get a more accurate bid and the more likely they’re a quality professional room addition contractor. Also ask a prospective room addition contractor who they plan to use for subcontractors and building material suppliers. Ask the room addition contractor if you can speak to a couple of their subcontractors to get a feel for them as well. It’s a very fair question to ask since these subcontractors will be walking around your home for weeks or months. Any resistance by the room addition contractor to allow you to contact the subcontractors is a red flag. Check with the building material suppliers to see how they like working with the contractor. Most building material suppliers will let you know if a general home remodeling contractor is worth his or her salt and whether or not they pay their bills on time. By doing the above prescribed room addition contractor screening checks, the likelihood of a positive outcome on your construction project will be greatly enhanced. Most homeowners who go through this type of room addition contractor screening process end up with completed building projects that are done on time and budget, and to the craftsmanship level they expected. The only things they don’t get are horror home construction stories to share with friends and family.